Although it feels like warm weather is far away with all the freezing temps and snow Spring will be here soon. Now people are hustling with planning. Home shows are already beginning. Outdoor events are getting placed on calendars. The new year is in full swing. If you’re still thinking about finally getting that custom deck built it’s not too late. A custom deck in Omaha can be enjoyed for most of the year, and with cover year round. Like a remodel or any home upgrade, adding an outdoor living area adds immense value to your home. You’ll get back everything you spend or more with the additional curb appeal. It will also increase your chances of selling, when and if you do sell. If you enjoy having friends and family an elite custom built deck is the perfect way to add functional space where people can gather and enjoy one another. Decks are open and in the fresh air – so much better than a claustrophobic crowded room. Clean up is easy on a deck, and everybody loves a good barbecue. Far from porches of the past, modern decks offer designs and functionality that have to be seen in person to believe. They’re low to almost no maintenance. The longevity of a custom built deck can be 20-30 years based on materials used. Not only are modern decks durable and functional, but they also come in nearly any look and structure style you can imagine. Using state of the art materials, you can have an exotic hardwood look to rustic pine, and more. Give us a call today and schedule your deck build. If you’re not sure what you want come by our showroom and see what we can offer in person. One of our deck building experts can walk you through all of your options and give you a free quote. This entry was posted in Custom Decks Omaha and tagged custom decks omaha, deck building omaha, decks omaha, Home Upgrade on February 26, 2019 by Decks, Decks and More Decks. The end of the year is upon us. It’s been a wonderful year, and we’re looking forward to all the new decks in Omaha for 2019. We want to thank all of our customers and let everyone know that we’re year-round custom deck builders. That’s right; we build decks in the cold of winter. In fact, Winter is one of the best times of the year to get your elite custom deck built. Spring and Summer get very busy in the construction industry, but in Winter it nearly shuts down. So when you decide to get your deck built in the Winter, we can likely get it done a little faster. We’ve mastered the art of year-round deck building. We’ve been successfully installing low-maintenance decks in the cold for nearly four decades! Yes, it does. Different materials require different specifications at different temperatures. As certified installers of Trex, TemberTech, Azek and Deckorators products, we know and understand how to build any time of the year. We live for building decks, and take pride in our ability to build any time of the year. If we weren’t building decks, we really wouldn’t know what to do with ourselves. Start Fast – In Winter, most construction slows down or stops. Our schedule does become more flexible, and we’re able to get the job done faster because our crews can focus on fewer projects. When you get your custom deck built in the Winter, you can start faster and finish sooner. Lower Humidity – Low humidity can help a structure settle properly. Omaha gets a little humid in the Summer months as we know. Ready for Warm Weather – The nice thing about having your deck completed before nice weather comes is it will be ready to use when nice weather does arrive. While other homeowners are watching the construction crew build their decks, you’ll be BBQing and enjoying time with your friends and family as soon as the weather turns nice. This entry was posted in Custom Decks Omaha and tagged custom decks omaha, deck building omaha, decks omaha on December 28, 2018 by Decks, Decks and More Decks. If you’ve ever thought of adding deck lighting to your Papillion custom deck, low-voltage LED lights offer several advantages that are hard to beat. Not only do they offer big savings but the quality and range of the lighting is unmatched. We’ve been building custom decks in Papillion for a long time now, and always recommend LED lighting for our customers. If you’re looking for elite level deck lighting that doesn’t break the bank, consider the benefits of low-voltage LED deck lighting. One of the biggest benefits of using LED deck lights is the amount of time they last. Some LED lights can last around 100,000 operating hours. Unlike other bulbs, LED lights never really burn out, they will gradually dull overtime, so you will never be unexpectedly left in the dark. Nor will you be replacing bulbs frequently. Getting LED lights installed on your deck ends up saving you money in the long run. Because they are so energy efficient you will actually see a reduction on your utility bill verses using traditional lighting. In addition, they can work on photocells to turn off and on based on the sun, so they’re never on when they shouldn’t be. You don’t have to feel guilty about using them, and you can always have your deck looking great at night if you choose to. The durability of LED deck lights is second to none. They’re made from very resilient components that are designed for outdoor use. They can withstand the elements, standing up to rain, wind and snow. They’re perfect for taking on everything Papillion weather can dish out. Unlike other light types, LED lights work regardless of temperature allowing you to enjoy your deck year-round. Even the coldest or hottest of days won’t affect their operation, making them ideal for use in climates like Papillion that get big temperature swings and extreme temperature indexes. Because LED deck lights are low voltage bulbs, they can be integrated into any power source easily. You do not need to increase energy capacity or have special wiring done to accommodate their installation. Nothing quite brings your Papillion deck to life like custom LED lighting. Not only do they look great, but they add a big safety element to your deck steps with the illumination they provide. With all of the advantages upgrading your deck with LED is an easy decision. This entry was posted in Custom Decks Omaha and tagged custom decks omaha, deck building omaha, Deck Lighting, Deck Tips, decks omaha on August 7, 2018 by Decks, Decks and More Decks. More than a few times we’ve been mistaken for a franchise. Our logo and graphics and exposure around Omaha has led many to think we’re franchised. Although we take it as a compliment, the truth is we’re not a franchise. We’re simply a locally owned and operated family business that puts everything we have into working hard and conveying a professional appearance. We don’t report to corporate, we report to you – our customer. Our name is always on the line. Taking pride in our craft is what has lead us to be considered the go-to company for custom decks in Omaha. When you work with a family owned business you get a different type of service than can be offered by a franchise. Some might call it an elite service. Family businesses like ours employ a number of family members that have already developed a long-standing chemistry. Our non-family employees quickly take notice and effectively become part of the family. The workplace tends to be less formal, more hands on and more personable. When we’re on a job we’re all on the same page and can effectively communicate with one another and play our individual roles to reach our full potential. We hold each other accountable and encourage each other to get better every day. We know that our names and personal reputation are on the line whenever we interact with a customer or accept a job. Because there are no “higher ups” to run ideas by, we think of and then implement new ideas within a matter of hours. We don’t have to wade through any bureaucracy. It makes us more efficient and helps us to constantly fine tune our skills an innovate freely. Everyone wants to work with a business they know they can trust. It can be difficult to find a business that resonates with your values across the board. Family-owned businesses have a leg up on franchises when it comes to trust because the names of their brands are directly associated with their family legacies. Family-owned businesses are known for their dedication to values and traditions. Family business owners have the opportunity to teach and pass along their business and personal values to the next generation. Family members take pride in upholding these family values and build them into their day-to-day work and personal activities. The work culture is often a reflection of these family values. If you’re looking to get your new deck installed by experts who work like a family unit give us a call today. Our name is behind every job we do. This entry was posted in Custom Decks Omaha and tagged custom decks omaha, deck building omaha, decks omaha on June 28, 2018 by Decks, Decks and More Decks. If you have the time and energy a do it yourself project can be very rewarding. Whether it’s changing the brakes on your vehicles instead of taking it to a mechanic, or designing and building your own garden, it feels great to do things yourself. The sense of accomplishment is immense, especially when you succeed. We don’t want to knock people who take a do it yourself approach, in fact we encourage it, but not when it comes to building a deck. Building a deck in many ways is like building a miniature house. Maybe because it’s an extension of your house. The skills, tools, and knowledge needed to get the job done correctly, efficiently, and in a cost effective way takes years of experience. We’ve been building elite custom decks in Omaha for a long time now, and want to emphasize the importance of working with professionals when it comes to deck building in Omaha. Your deck is literally an extension of your home. Would you attempt to build your own home? Maybe you would if you had mastered the skills of homebuilding. But would you build your home as a DIY project if you had no to little experience as a builder? Probably not. The same goes for decks. Although a deck may look simple at first glance they are a compilation of master planning, elite carpentry skills, and experience. Decks are not simply boards and nails, if they’re any good. When you decide to build a deck yourself your excluding yourself from using the best materials on the market. You’re stuck with low-grade materials like the ones from box stores or pressure treated decking and railing from the local lumber yard. You can certainly build a deck with these materials, but it’s going to be of lesser quality, require more maintenance, and the life will be short. 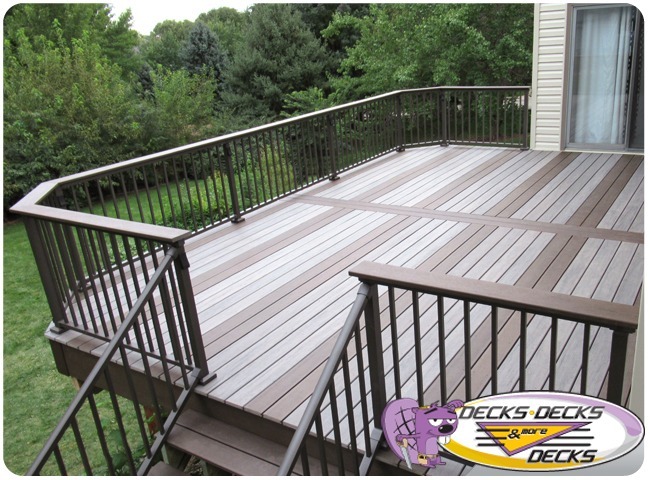 When you work with a professional deck builder you get the most up to date decking materials that are designed to last multiple years and require little to no maintenance. Designing a functional aesthetically pleasing deck that’s going to last is not easy. It takes skill and know how that you can only get through multiple years of experience. Knowing the angles and weight distributions and all the geometric complexities that go into deck design is not something you master on the weekend. Even if you could source the best materials possible, being able to design a deck that takes in all the variable necessary to make it work and last is nearly impossible for the average DIY project. This entry was posted in Custom Decks Omaha and tagged custom decks omaha, deck building omaha, decks omaha on May 17, 2018 by Decks, Decks and More Decks.